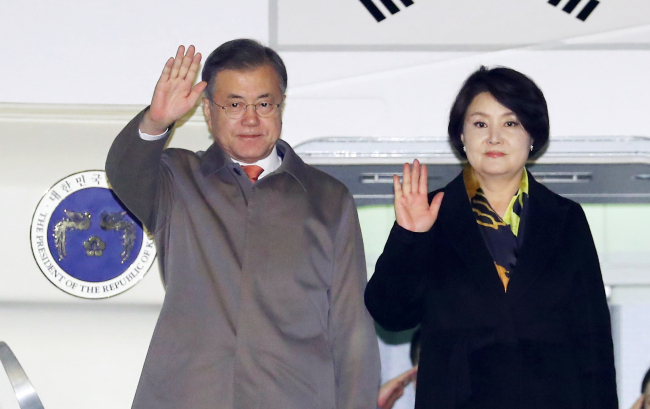 PRAGUE, Nov. 27 (Yonhap) -- South Korean President Moon Jae-in arrived in the Czech Republic on Tuesday, en route to Argentina for the annual Group of 20 summit. Moon is scheduled to hold a bilateral summit with Prime Minister Andrej Babis on Wednesday. He will also hold a special meeting with South Korean residents in Prague before heading to Buenos Aires, according to his office Cheong Wa Dae. Moon will arrive in Argentina on Thursday for a three-day visit that will include a bilateral summit with his Argentine counterpart, Mauricio Macri. It will mark the first South Korea-Argentina summit in 14 years, Cheong Wa Dae said. The G-20 summit will be held Friday and Saturday, bringing together the heads of state and government from 20 developed and developing nations throughout the globe. President Moon is also scheduled to hold bilateral meetings with the leaders of South Africa and the Netherlands. Cheong Wa Dae officials have said the president may also hold a bilateral summit with US President Donald Trump on the sidelines of the G-20 summit, but that the specific time and venue of the first South Korea-US summit since September will be decided later. Moon will arrive in Auckland on Sunday, following his departure from Argentina the previous day. His visit to New Zealand will be a state visit that will begin with an official welcome ceremony, followed by a meeting with Gov.-Gen. Patsy Reddy. He will also hold a bilateral summit with Prime Minister Jacinda Ardern before heading home Tuesday.